Salesforce events are always a hit among all Salesforce and Cloud enthusiasts. Where Salesforce India is growing at a fast pace, there’s a lot happening around the sphere with continuous opportunities evolving in the Salesforce ecosystem here in the Asian sub-continent. Salesforce is the host of the biggest ever cloud event – Dreamforce, in the world. And with Dreamforce being such a breathtaking event, any Salesforce powered event has with it a lot of expectations. 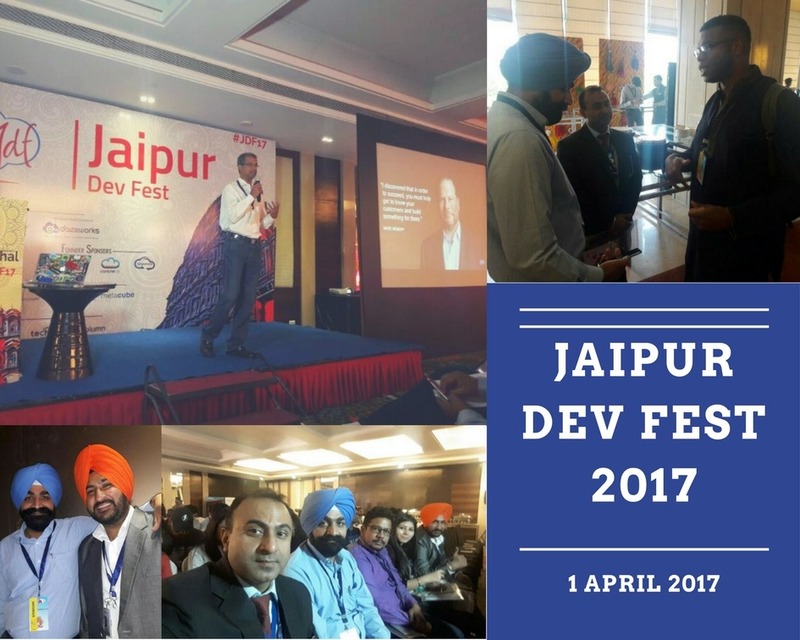 JDF ’17 – Jaipur Dev Fest 2017, held on 1st of April, 2017, was one such event organized by highly experienced and innovative team of Salesforce evangelists and MVPs – Gaurav Kheterpal, Durgesh Shoot, Bhawani Sharma, Ankit Arora and Abhinav Gupta. A bunch thanks to the team for getting it all done so amazingly. Being one of the first of its kinds, the event marketing started with just the right pace and target audience. We, at Signity, too were personally approached and having looked at the wonderful agenda and plans, we quickly agreed for the sponsorship! 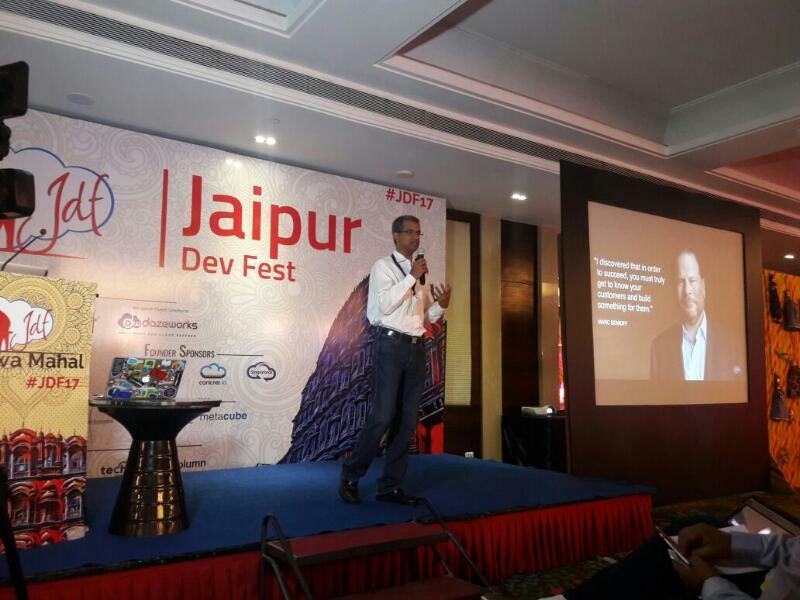 Being held in Jaipur, the event had a spicy Indian flavor of Rajasthan. Everything from the logo to the collateral and the website had that aroma. We also got to meet experts like PritamShekhawat, Madan Khichi, VipulGoel, Atul Guptaand more from across different high-performing and innovative organizations who shared their experiences and know-how on Salesforce and its scope. Wow! That’s the word – a team of young, enthusiastic and super-talented individuals who got the whole day packed with innovative, information, insights, great food and music, fun, ideas and networking. Considering the fact that Salesforce Events in India are still budding, the event was perfect in terms of management and organization – it was well-planned, disciplined and beautifully balanced. Thanks to all the volunteers! Sumptuous breakfast, lunch and dinner spreads with amazing music to tap feet onin the after party, exciting fun zones and activities, networking over meals– JDF ’17 was truly an unforgettable day at Hotel Radisson Blue, Jaipur. Signity Solutions, also an authorized Salesforce partner is always up and ready for such thought provoking and inspirational tech events. With Salesforce consultation, 3rd party integration, implementation and custom development being our service expertise, we love collaborating with like-minded people who love technology and empowering businesses with automation and cloud technology. Our team once again sends kudos to the organizing committee and everyone associated for such an enlightening and inspiring event. For any questions or queries, please write to us at info@signitysolutions.com.